Case Construction Equipment offers seven mini excavators: the CX17C, CX26C, CX33C, CX30C, CX37C, CX57C and CX60C. 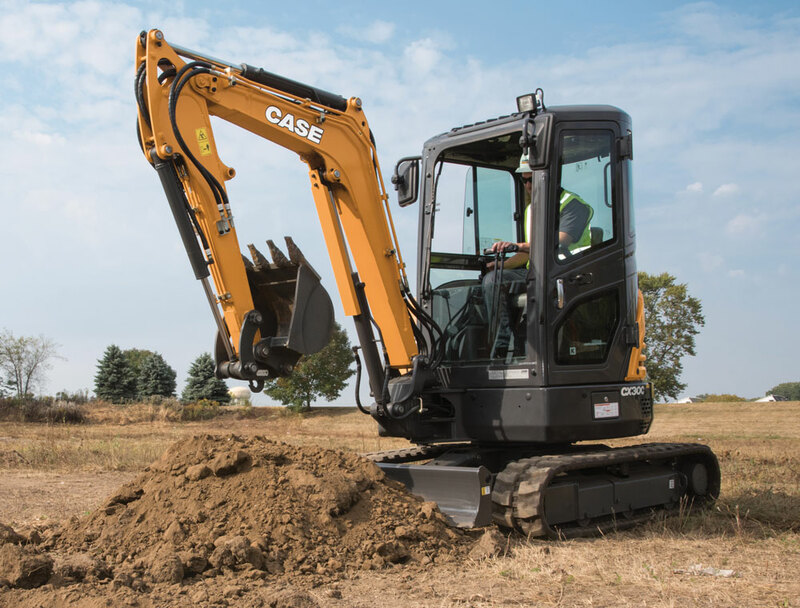 This updated offering expands the Case mini excavator lineup to its broadest range of sizes ever and provides a more comprehensive and feature-driven compact excavator solution to the construction, landscaping, utility and rental markets. The CX57C and CX60C offer best-in-class horsepower and provide greater power and performance than any previous Case mini excavators. Each model features a variety of standard features designed to improve productivity and performance. Offered in zero tail swing, short-radius or conventional configurations, C Series mini excavators feature an adjustable boom with the ability to offset left or right to work closer to buildings and obstacles. The CX17C features a variable-width undercarriage and adjustable blade capable of passing through most common gates and for working on confined jobsites, close to buildings and in developed areas. Weighing 7,990 lbs and with bucket digging forces up to 4,470 ft-lbs, the CX37C is a versatile machine — powerful enough for tough jobs but nimble enough to access more confined areas. In addition to that, like all C Series models — with the exception of the CX57C and CX60C — it can be towed with a pickup truck without the need for a CDL (depending on local and state regulations). Standard proportional controls provide precision control of all attachments with the ease-of-thumb control, while a standard auxiliary flow diverter valve (CX17C to CX37C) allows the operator to easily switch between single and bi-directional flow for use with a variety of attachments. An easy-to-use pattern selector also comes standard, allowing operators to choose their control pattern preference for optimum productivity. A standard Auto-Shift travel system provides operator comfort and convenience by securing travel speed and torque as ground conditions change. All C Series mini excavators also feature standard auxiliary hydraulics for easy thumb and attachment setup, as well as standard boom and blade guarding. The CX57C and CX60C come standard with an LCD touchscreen with up-to-the-minute machine performance data and intuitive access to machine settings. The C Series mini excavators provide a spacious, stress-free operator environment and feature all-around visibility, ergonomic controls, adjustable seating and line-of-sight digital displays for improved operator comfort. Learn more about Case here.